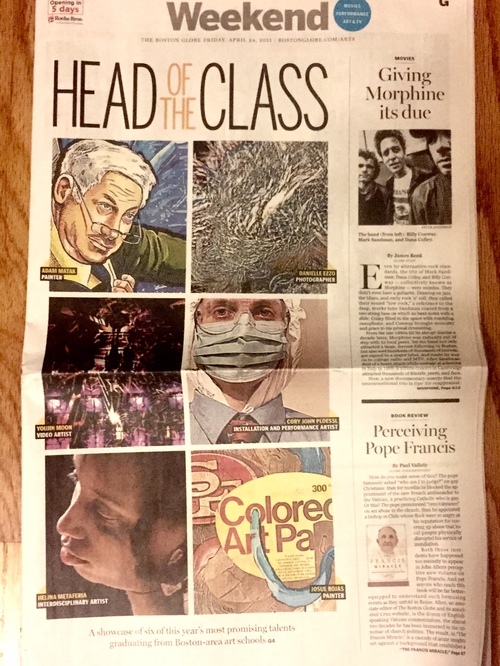 I am happy to be featured in the Boston Globe today in an article on top MFA candidates in Boston, written by art critic Cate McQuaid. It was a good overview to my work and my upcoming thesis exhibition/performance on May 14 at the Boston Center for the Art's Cyclorama. Here is a link to the online edition of the article. The Great American Performance Art Festival is a series of performance art events curated around the question of American identity and its implications, most specifically the notion of borders and barriers. This exhibition features artists from Mattapan and Roxbury and is part of Medicine Wheel Productions' multi-year Brooch project "that is engaging the communities along the unfinished line of Olmsted's Emerald Necklace." Boston/DC transplant artists work through the nature of living in transient communities through performative works. Artists: Aparna Agrawal, Alexandra Borovski, Dana Caroll, Allison Cekala, Kaitlyn Clark, Holden Holcombe, Yin Liu, Yushan Liu, Helina Metaferia, Nick Procopi. END RECORDINGS will feature works in time-based media by eight graduating Master’s candidates. Their works highlight the complexities of transnational identity, expose a transgender man’s struggle to transition, instruct us in the art of communication, sensitively deal with loss, and explore landscapes which are lush, artificial, surreal, and dystopian. The show will present a vast array of perspectives from Boston’s emerging moving image artists. Featuring film/video, painting, performance, sculpture, photography, drawing and more, this dynamic, group exhibition will feature graduating students of the 2015 MFA class.